It's amazing but true; you can fulfil your heart's desires by using these squares! 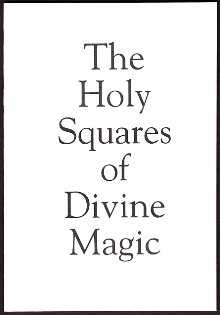 Whatever your need, any one of the 132 Holy Squares of Abramelin the Mage in this booklet can be applied! Her domestic life seemed in chaos; Her husband seemed no longer interested in her and the children were out of control. Within two weeks of carrying the appropriate square, she reports, their attitudes had completely changed. 'It seems like a miracle', she says, 'my husband is more caring, and the attitude of the children has improved beyond belief'. She spoke the magic words and carried the square - and got a convincing result! Such is typical of the many seeming 'miracles' reported by purchasers of the Holy Squares of Divine Magic. There are several different squares provided. Arouse the passion of a cool person... Command the undying love of another... Even make yourself look younger. We don't know. Tradition asserts that the so-called sacred images enclosed with the squares activate unseen mystic forces which affect the material world. Whatever the explanation, the fact is that those who carry these squares report strange, but wonderful happenings! There are some young people who feel, for whatever reason, that their youthful appearance is a handicap. There is a holy square to make you look older than you really are! LARGE BLOOD CLOT DISAPPEARS! DEATH AVERTED! One man was seriously ill; he kept a square on his person and received vital information which he believes saved his life. Two years later he reported that his health was still improving. Another man claims a large blood clot disappeared miraculously after carrying a square. These claims are from actual unsolicited testimonials received at our offices. Try the Holy Square of Divine Magic and judge the results for yourself! You need no experience in matters mystical to obtain results. You can be a practising Muslim, Christian or Jew and still get results. The squares do not compromise your beliefs! 132 squares are illustrated in this publication. You can either cut out the squares or draw them. The instructions are extremely simple. No paraphernalia is required; neither visualisation and complicated rituals and prayers are involved. Not all the Holy Squares are for good purposes. For example, there are squares to make two people quarrel and break up... there are squares to make two women turn against each other... and so on. But for the most part the squares cover positive aims. Squares are given for these specific purposes: MASTERING A FOREIGN LANGUAGE... CURING AGORAPHOBIA... FINDING LOST PROPERTY... DETECTING TRUE OR FALSE FRIENDS... BECOMING AN EXCEPTIONALLY GOOD SWIMMER... CURING SORE PALMS & FEET... CURING EXCESSIVE BODY FLUID... CURING CLAUSTROPHOBIA, ARTHRITIS, MIGRAINE, SEA SICKNESS, FEAR OF HEIGHTS. Squares are also given for many other health and emotional problems. MONEY... LUXURIES... LOTTERY WINS... AND MORE! Those who scoff at these powers should note that just moments before preparing this advertisement a 71-year-old pensioner from Gloucestershire wrote to say he had just won £100,000 on the lottery, and he enclosed the local newspaper's report of his win as proof. He believes his amazing luck was down to following the simple instructions of Jason Pike, compiler of Abramelin's squares. This publication contains the actual squares for RECEIVING LARGE SUMS OF MONEY. The squares bring protection, too. Specific squares are given for protecting your home and rendering another person's curse ineffective. Extraordinary claims were made by Abramelin the Sage for the mystic powers in these squares. Compiler Jason Pike saw his guardian angel literally appear before his eyes as he held the appropriate square in his hand. A square to ask your guardian angel to do your bidding is given. Holy Squares are provided for these specific purposes: becoming invisible... discovering hidden secrets... successfully undertaking alchemical experiments. Even natural phenomena comes within the squares' scope. There are Holy Squares for: controlling weather conditions... foreseeing storms, where and when they will happen... safety in mountain climbing.